The year 2016 was filled with healing, promise and economic opportunity for Orange County and its residents. As a result of the region’s culture of collaboration, Orange County remains No. 1 in the nation for job growth among large regions and continues to create thousands of new jobs. The quality of life for citizens of Orange County continues to be enhanced by investments in infrastructure such as roads and parks, cultural arts venues, and programs that seek to aide our most vulnerable citizens. Unfortunately, the community experienced an unthinkable tragedy on June 12, when 49 innocent lives were taken and hundreds more were changed forever as a result of the mass shooting at the Pulse Nightclub in Orlando. In response, Orange County, the City of Orlando and the extended community united in a way that the world had never seen before. A few months later, during the early morning hours of October 7, the effects of Hurricane Matthew impacted Orange County and the greater Orlando area. The Category 3 hurricane was the first major storm to impact Central Florida since 2004. Through multiple platforms – including web updates, social media, live broadcasts of media briefings by Orange TV, and continuous updates pushed through Orange County’s emergency notification and information smartphone apps; Orange County provided critical information throughout the Pulse tragedy as well as before, during and after the storm. The Newsroom’s pre-launch monthly average was 200 page views and 100 visits. Launched in April 2014, the Newsroom reached 120,180 views during June as a result of Pulse and an all-time high of 130,365 views and 87,527 visits in October 2016 during Hurricane Matthew. In addition to proving its value during emergency situations, Orange County Government continually provides breaking news and updates on the region’s strong economy, continued job growth, economic achievements and incredible milestones for Orange County’s internationally-renowned sports, arts and cultural venues through its online newsroom. Orange County’s mobile applications – OCFL News, OCFL 311 and OCFL Alert – also keeps citizens appraised of the latest regional news and emergency weather alerts. The Newsroom Media Center received more than 1 million page views and Orange County’s website had 60 million page views in 2016. The Hurricane Matthew Information page was the County’s official digital resource for citizens to view information on sandbag distribution locations, curfew updates, shelter openings, storm debris collection and more. The page was extensively utilized from Oct. 4 through 10, as citizens braced for Hurricane Matthew and its aftermath. The Orange County Emergency Operations Center (EOC) was activated on October 6 to mobilize rapid response teams from partner agencies, local municipalities, utilities, roads, drainage, fire and rescue and law enforcement to monitor and assess Hurricane Matthew. More than 1,400 citizens took refuge in Orange County shelters, including 80 citizens with special needs. 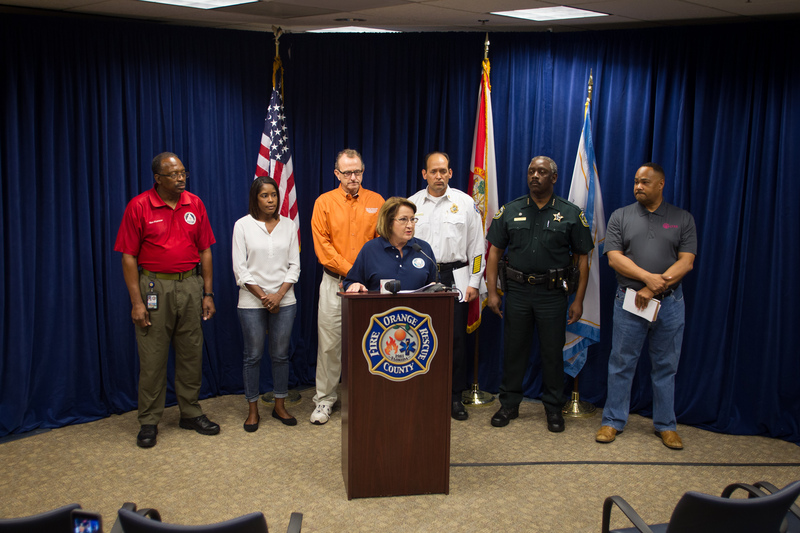 These shelters opened with the support and coordination of Orange County Public Schools and the American Red Cross of Greater Orlando. To help prevent damage caused by stormwater, Orange County Public Works distributed more than 78,000 sandbags to area residents. On June 12, Orlando and Orange County experienced the darkest and most difficult day of its history. The incomprehensible act of hatred, terror and mass murder that took place at Pulse Nightclub deeply impacted the nation and world, the LGBTQ+ community in Central Florida, as well as the broader Latino community. The Pulse Nightclub Tragedy webpage provided critical information, including ways for citizens to help, resources for families of the victims, updates from the Orange County Medical Examiner’s Office and press conference details. Orange County worked diligently during the transition to a new automated garbage and recycling collection program. The County provided guidelines and updates on the new automated collection process. According to the Orange County Office of Emergency Management, warmer waters over the eastern Pacific Ocean near the equator and the resulting influence on the atmosphere indicated a strong, and perhaps historic, El Niño season in 2016. For Central Floridians, this meant an increase in storms, like Hurricane Matthew, and a greater potential for severe weather with significant impacts. The Orange County Economic Summit is hosted annually by Mayor Jacobs and provides an annual report on the economy, as well as highlight strong business sectors and growing industries. The 2016 Economic Summit was attended by more than 650 citizens and community leaders eager to hear about the region’s flourishing economy.